This is the smallest vinyl run our micro-independent record label (Shape) has ever done. We've done 150 before and 250 a couple of times, but never as low as 100. I’ve been asked a lot about it - things like “where did you get it pressed?” and “just, why?” so I thought it might be useful if I wrote about the reasons why I did it and what I have learnt. The main reason I pressed 100 records is because it was how many I thought I could sell. I had never released or recorded anything as Farm Hand before and I started thinking at a hyper local, micro level - more craftsman than rockstar. 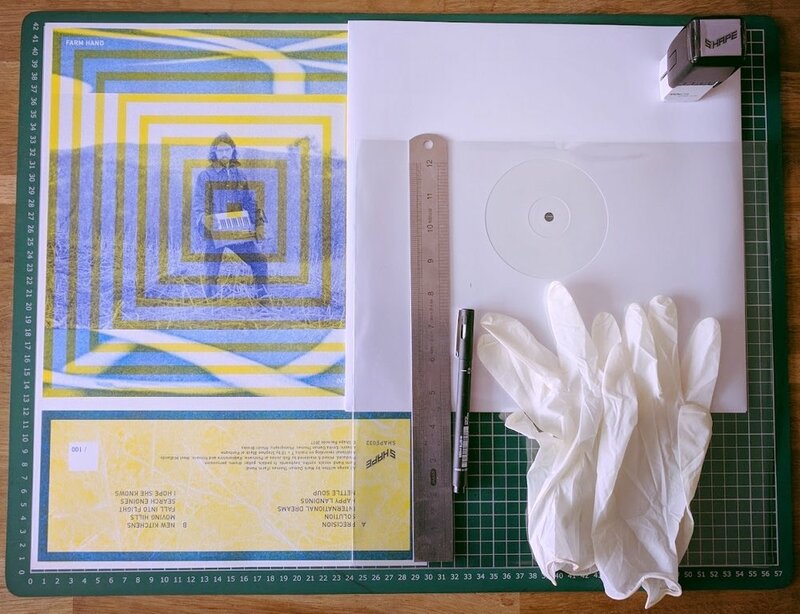 The A3 print, white label record, clear sleeve, Shape stamp and pen, ruler and gloves. Missing from this is the 'A' stamp I put to signify the A side. What have I learnt from pressing 100 records / this release in general? It is very easy to tell what percentage of sales you are on with 100 copies. Full disclosure: I’m on 76% now. Doing an album launch party at a record shop is a good idea. I did a live performance in Spillers Records, Cardiff for this one and it was a wonderful occasion. I sold 25% of the records there and then and really enjoyed chatting to everyone who came (thanks again). Spillers is a rarity - the staff seriously know their music - they are human algorithms. Acting small time feels really refreshing, in an era of big data and success being defined by the countless numbers we look at be it followers, plays, likes etc (which are never high enough). It feels nice walk in the other direction from all of that and to go small scale. The small numbers involved has meant I have been able to have direct communication with practically everyone who has bought a copy. 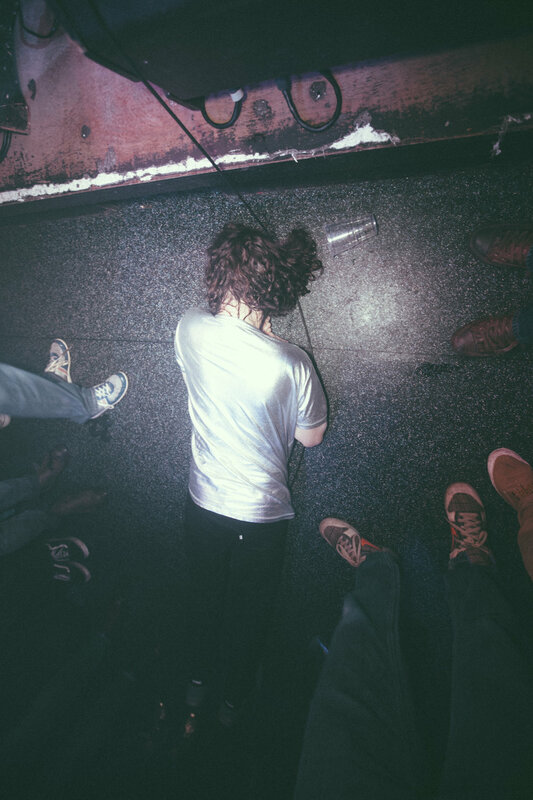 This has happened in person at gigs, via email, DMs or comments on Twitter, Facebook or Instagram. It feels great to have those conversations and I can tell people how much I appreciate them buying it. Pressing a physical item means you can build your release around it. Release dates are relatively meaningless otherwise seeing as you can upload and digitally distribute the recordings as soon as you have the masters. The company I used (Mobineko) has a 12 week waiting time on vinyl, I saw this as a good thing as it gave me more time to get my house in order and try to get most of the admin and marketing stuff sorted. I enjoyed trying to think creatively about ways of actually selling the records. It is one thing pressing the records but the selling them bit is the bit that can easily be forgotten. One of my main reasons for pressing records is because I enjoy the challenge of trying to make the outlay back (£653 for the records in this case). I can't afford not to make it back so it motivates me to get to work! I wanted to try things I’d never done before so I made music videos on my phone, wrote blogs and livestreamed gigs and process / behind the scenes stuff from my house. One afternoon I went live on Facebook and documented myself stamping, numbering and folding up the A3 riso prints and inserting them into their sleeves. The peak audience was 7 people. Overall about 40 people tuned in and I ended up selling 5% of the records during the broadcast. I plan on doing more of these as I enjoyed it. I also worked with a great PR person (shout out to Anastasia!) who helped me get interviews and track by track features on some of my fav music places like Gold Flake Paint, Drowned In Sound and M Magazine and reviews on cool sites like God Is In The TV and Louder Than War. I set very small aims. My first aim was to sell 20 copies by the release date as pre-orders. I achieved that the day before and felt good. I did the pre-order via Bandcamp and overall I’ve sold 26% of them on that site. I 100% recommend using the site for small scale releases like this - the new app is insightful and great. I hand numbered, hand stamped and folded and inserted the print into the clear sleeves myself - there is something quite nice about having had that 'relationship' with every single one. It is easy to track the distribution. The only shops you can buy the record in are in Wales. I have some in Spillers, some in Hardlines Coffee (both Cardiff) 5 in Tangled Parrot Carmarthen and Hay. As far as I know at least one member of staff at each has bought a copy. I have huge respect for the people who run these places where we can sell our weird music operating outside of the mainstream. I know my music is niche - it is meant to be. It is non-commercial on purpose. It doesn’t sound like it does by accident, I like it. The release has helped me reconnect with what Shape is. I had sort of got to the point where I didn’t understand what the label was for or what it did but doing this has helped me to be re-energised and excited about it’s future. I can't put my finger on why, it just has. It is odd promoting your own record from your own label though, I do find it tricky and 3rd person Tweets always feel lame. I feel quite at ease with selling it at £15 - even to friends. Seeing as there are only 100 - I can’t afford to give anyone a copy so if someone really wants one, they will buy one. It feels so supportive than when a friend orders or buys your record. The maths of pressing 100 records is almost ridiculous. It was £643 for pure black vinyl in disco sleeves. It costs £798.00 for 250. That is another 150 records for an additional £155. I didn't want 250 though, I wanted 100. The riso-sleeves were £50 (from The Holodeck in Birmingham) and the clear sleeves were £30. I'm aware I'm lucky to cut one cost as Emma kindly and skilfully designed the art / print / album cover for me in house (as in, in the house). I think that’s it for now. Thanks for reading. If you'd like to take me up to 77% of sales please click here - I will send you a very appreciative email. Pleasingly I just did a google of 'Farm Hand International Dreams' and found out that the album is one of Wales Arts Reviews 'Best Welsh Albums of 2017'. Cheers!